Throughout Scripture God reveals Himself to us through His Names… and when we study these Names that He reveals to us in the Bible, we will better understand who God really is. 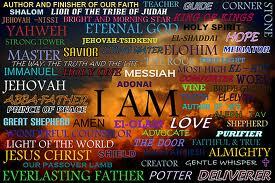 The meanings behind God’s names reveal the central personality and nature of the One who bears them. To hallow a thing is… to make it holy or to set it apart to be exalted as being worthy of absolute devotion. To hallow the Name of God is to regard Him with complete devotion and loving admiration. God’s name is of the utmost importance (Nehemiah 9:5); therefore we ought to reserve it a position of grave significance in our minds and hearts. We should never take His Name lightly (Exodus 20:7; Leviticus 22:32), but always rejoice in it and think deeply upon its true meaning. ELOHIM (God) (el-o-heem') God, Judge, Creator… In the Old Testament Elohim occurs over 2000 times. Elohim is first used in Genesis 1:1. 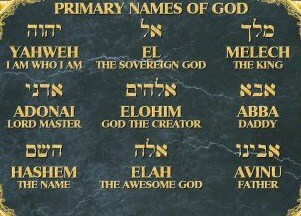 Elohim is translated as “God.” The derivation of the name “Elohim” is debatable to most scholars. Some believe it derived from “EL” which, in turn, originates from the root word, “wl” (which means “strong”). YAHWEH (yah-weh) YHWH – Lord, Jehovah, Master, denoting the omnipotence of God, absolute ruler… In the Old Testament Yahweh occurs 6,519 times. 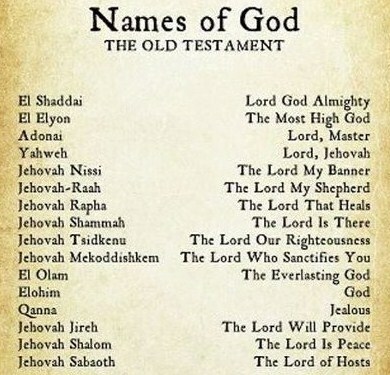 This name is used more than any other name of God. Yahweh is first used in Genesis 2:4. Yahweh is the promised Name of God. 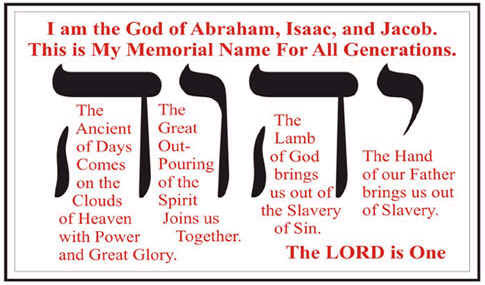 This Name of God which (by Jewish tradition) is too holy to voice is actually spelled “YHWH” without vowels and so they would rather use “HaShem” (or Adonai) meaning “the name of God.” “HaShem” is used 7484 times in the Tanach. YHWH is referred to as the Tetragamatron (which simply means “the four letters.” YHWH comes from the Hebrew letters: Yud, Hay, Vav, Hay. While YHWH is first used in Genesis 2, God did not reveal Himself as YHWH until Exodus 3. The modern spelling as “Yahweh” includes vowels to assist in pronunciation. Many pronounce YHWH as “Yahweh” or “Jehovah.” We no longer know for certain the exact pronunciation. During the third century A.D., the Jewish people stopped saying this name in fear of contravening the commandment and say… “You shall not misuse the Name of HaShem your God, for HaShem will not hold anyone guiltless who misuses His Name.” Exodus 20:7. As a result of this, Adonai is occasionally a substitute for YHWH. The following compound names which start with “YHWH” have been shown using “Jehovah.” This is due to the common usage of “Jehovah” in the English of these compound names in the early English translations of the Bible (e.g., the Geneva Bible, the King James Version, etc.). ADONAI (ad-o-noy') – Lord, Master… In the Old Testament Adonai occurs 434 times. There are heavy uses of Adonai in Isaiah (e.g., Adonai Jehovah). JEHOVAH SABAOTH (yeh-ho-vaw' se ba'ôt) The Lord of Hosts - The Lord of Powers… Jehovah and Elohim occur with “Sabaoth” over 285 times. It is most frequently used in Jeremiah and Isaiah. Jehovah Sabaoth is first used in 1 Samuel 1:3. Jehovah is translated as “The Existing One” or “Lord.” The chief meaning of Jehovah is derived from the Hebrew word “Havah”… meaning “to be” or “to exist.” It also suggests “to become” or specifically “to become known”… this denotes a God who reveals Himself unceasingly. Sabaoth (se ba’ot) mean “armies or hosts.” Jehovah Sabaoth can be translated as “The Lord of Armies” (1 Samuel 1:3) - this name denotes His universal sovereignty over every army, both spiritual and earthly. C.H. Spurgeon said this about the phrase; “The Lord of Hosts - The Lord rules the angels, the stars, the elements, and all the hosts of Heaven; and the Heaven of heavens is under His sway... (The Lord) is on our side - our Ally; woe unto those who fight against Him, for they shall flee like smoke before the wind when He gives the word to scatter them.” See Psalm 46:7. The Lord of Hosts is the king of all heaven and earth. (Psalm 24:9-10; Psalm 84:3; Isaiah 6:5). 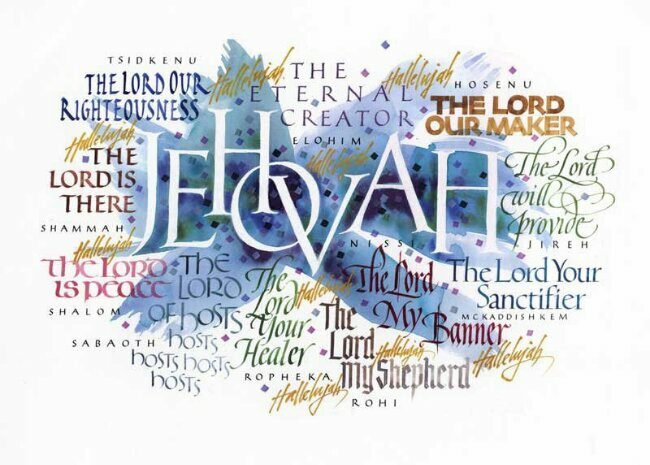 JEHOVAH JIREH (yeh-ho-vaw' yir-eh') The Lord Will Provide - The Lord has seen… In the Old Testament Jehovah-Jireh occurs only once in Genesis 22:12 – 14 and is translated as “The Existing One” or “Lord.” The chief meaning of Jehovah is derived from the Hebrew word “Havah” meaning “to be” or “to exist.” It also suggests “to become” or specifically “to become known”… this denotes a God who reveals Himself unceasingly. Jehovah-Jireh is a symbolic name given to Mount Moriah by Abraham to memorialize the intercession of God in the sacrifice of Isaac by providing a substitute for the imminent sacrifice of his son. “The Lord our provider” - This is also the name Abraham gave to the place where the Lord provided a sacrifice in place of Isaac. (Genesis 22:14). This is what we long for when we have a need that is personal and special. He is the one who will see to our needs and provide for us. This is what Jehovah-Jireh means; the Lord who will see to it that my every need is met… One who knows my need because He sees and the One who is able to meet my need in just the right time as He did for Abraham… and One who can meet it fully. For Abraham, it was the ram caught in the thicket that was offered in Isaac's place. For us it is whatever we need… something like the story of Yeshua (Jesus) and the offering of Calvary. The name Jehovah-Jireh is a name that is crucial for us today as we seek to know the Father. It is a name that assures us that our Heavenly Father is able to provide any need we have. Trust Him for that! In the Old Testament Jehovah-Nissi occurs only once in Exodus 17:15. Jehovah is translated as “The Existing One or Lord.” The chief meaning of Jehovah is derived from the Hebrew word “Havah” meaning “to be” or “to exist.” It also suggests “to become” or specifically “to become known” - this denotes a God who reveals Himself unceasingly. Nes (nês), from which Nissi derived, means “banner” in Hebrew. No, God has gone further, to reveal himself in history. Moses, recognizing that the Lord was Israel’s banner under which they defeated the Amalekites, builds an altar named Jehovah-Nissi (the Lord our Banner). “Nes” is sometimes translated as a pole with an insignia attached. In battle opposing nations would fly their own flag on a pole at each of their respective front lines. This was to give their soldiers a feeling of hope and a focal point. This is what God is to us: a banner of encouragement to give us hope and a focal point. “Our banner, a banner of love and protection” - also the name Moses gave to the altar he built after defeating the Amalekites (Exodus 17:15-16). The victory of Israel obviously depended upon Moses continually standing before God and not being weary in his praying. What in the story suggested that prayer was involved? We find the answer in verses 11-12. 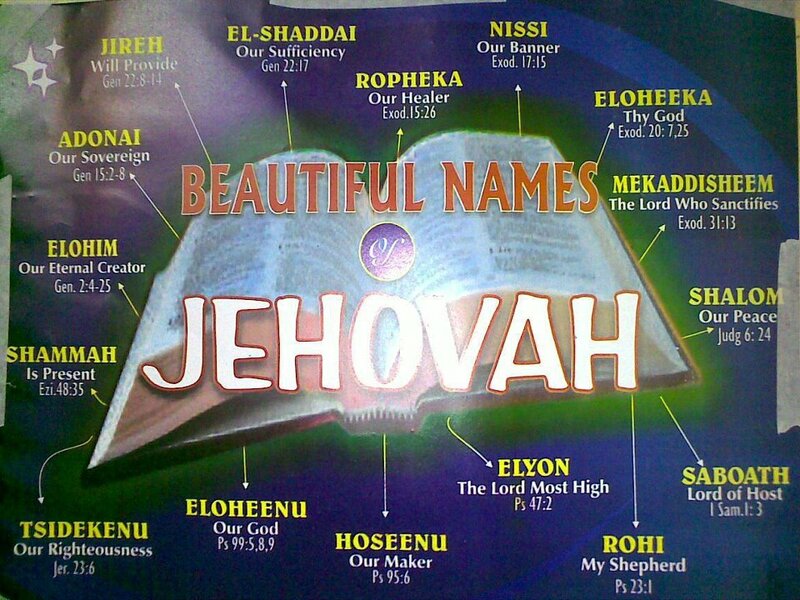 The Revelation of the Name Jehovah-Nissi; The Lord Our Banner, this name has to do with warfare. In this instance, the warfare involved God's very own. Our Father is willing to wage warfare on our behalf. One area of great battle has to do with our carnal nature. JEHOVAH SHALOM (yeh-ho-vaw' shaw-lome') The Lord is peace… Jehovah is translated as “The Existing One” or “Lord.” Shalom is a derivative of shalêm… which means “be complete” or “sound.” Jehovah-Shalom is the name of an altar built by Gideon in Ophrah. “Our perfect peace” - Also the name Gideon gave to the altar he built at Ophrah (Judges 6:24). Most know that the Hebrew word shalom is understood around the world to mean “peace.” However, “peace” is only one small part of the meaning. “Shalom” is used to both greet people and to bid them farewell, and it means much more than “peace, hello or goodbye”… Hebrew words go beyond their spoken pronunciation. Each Hebrew word conveys feeling, intent and emotion. Shalom is more then just simply peace; it is a complete peace. It is a feeling of contentment, completeness, wholeness, well being and harmony. Shalom means completeness, wholeness, health, peace, welfare, safety soundness, tranquillity, prosperity, perfect-ness, fullness, rest, and harmony, the absence of agitation or discord. Shalom comes from the root verb shalom meaning to be complete, perfect and full. In Modern Hebrew the obviously related word “Shelem” means to pay for, and “Shulam” means to be fully paid. Yeshua (Jesus) is called “Sar shalom” – “Prince of Peace,” which perfectly describes the ministry and personality of our Messiah (Isaiah 9:6). JEHOVAH TSIDKENU (yeh-ho-vaw' tsid-kay'-noo) – The Lord my righteousness - the Lord our God spoke to us… In the Old Testament Jehovah Tsidkenu occurs 2 times and first used in Jeremiah 23: 5 - 6 and then again in Jeremiah 33:16. Jehovah is translated as “The Existing One” or “Lord” and as we have seen that it also suggests “to become” or specifically “to become known” - this denotes a God who reveals Himself unceasingly. “Tsedek” (tseh'-dek), from which Tsidkenu derived, means “to be stiff…“to be straight,” or “righteous” in Hebrew. When these two words are combined… “Jehovah Tsidkenu” - it can be translated as “The Lord who is our Righteousness.” “The Lord is our righteousness” - The name is applied to a future Davidic king who would lead his people to do what is right and thus bring peace (Jeremiah 23:6) and to the restored city of Jerusalem (Jeremiah 33:16). The name is possibly a play on the name of Zedekiah (“Righteous (is) the Lord”) who reigned from 597 to 587 B.C. Jehovah-Tsidkenu — a name that is more obscure to the average Bible student, but nevertheless so very crucial in our understanding of all that God has done for us. In Jeremiah 23:5 – 6… a “righteous branch” is promised to Israel; One who someday will be king over Israel. His name is to be Jehovah-Tsidkenu or Jehovah our Righteousness. Israel had been carried into captivity, and now the same was to happen to Judah. It would seem that the promises of God would never be fulfilled. Such was not to be the case, however, and Jeremiah speaks of the day when a righteous king would return and set up His righteous kingdom and reign and do judgment on the earth. It is a word that is used in relation to God’s dealing with men. Though difficult to translate, it has to do with such things as justification, righteousness, and acquittal. When coupled with the name “Jehovah,” it means that all He does is ever and only righteous. He is the sole source of all that is righteous and good. This has great implications for us. First, how can I stand before One who is always perfect in all holiness and righteousness? I am a hopeless sinner! Thinking of some of our early studies in this ministry, when and how is this possible? How can we as sinners completely stained by evil, ever think we could stand before a holy God? What would be necessary for this? It is “Jehovah-Tsidkenu” who covers us with His righteousness that provides a shelter for us in His presence. JEHOVAH SHAMMAH (yeh-ho-vaw' shawm'-maw) The lord is there… In the Old Testament "Jehovah Shammah" occurs only once in Ezekiel 48:35. Jehovah is translated as "The Existing One" or "Lord"… this denotes a God who reveals Himself unceasingly. "Shammah" is derived from the Hebrew word "sham," which can be translated as "there." "Jehovah Shammah" is a symbolic name for the "earthly Jerusalem." The name indicates that God has not abandoned Jerusalem, leaving it in ruins, but that there will be a restoration. "The One who is with us everywhere for He is Omnipresent" - The Jerusalem of Ezekiel's vision… Ezekiel 48:35 was known by this name. Compare text at Isaiah 60:19-20 and Revelation 21:3. JEHOVAH RAAH (ROHI) (yeh-ho-vaw' raw-aw') – The Lord is my Shepherd… Jehovah is translated as "The Existing One" or "Lord." Jehovah is derived from the Hebrew word "Havah" meaning "to be" or "to exist." It also suggests "to become" or specifically "to become known" - this denotes a God who reveals Himself unceasingly. "Ro’eh" from which "Raah" derived, means "shepherd" in Hebrew. A shepherd is one who feeds or leads his flock to pasture (Ezekiel 34:11 – 15). An extend translation of this word, rea', is "friend" or "companion." This indicates the intimacy God desires between Himself and His people. When the two words are combined "Jehovah Ra’ah" - it can be translated as "The Lord my Friend." Further references of the name Jehovah-Ra’ah in the Old Testament: Genesis 48:15; 49:24; Psalm 23:1; 80:1). "Our Shepherd, who tenderly leads us, loves us and will keep us safe." The famous Psalm 23 tells us that "The Lord is our Shepherd and we shall not want...." Being illustrated as a shepherd implies a relationship with His sheep (His believers). The term shepherd appears approximately 80 times in the Scriptures, detonating meanings of: feeder, keeper, companion, friend, pastor and herdsman. This is perhaps the most familiar chapter in the Old Testament. Psalm 23 is a short Psalm...only six verses. But it is filled with words that elaborate on the central statement in which this compound name is included: vs. 1, "The Lord is my shepherd, I shall not want." Perhaps it is as the little boy said when he misread it, "The Lord is my shepherd, I don't want anything else." This is only one of the three Psalms that are the Shepherd Psalms. Psalm 22 is the Psalm of the Good Shepherd, laying down His life for His sheep. Psalm 24 is the Psalm of the Chief Shepherd, Who is coming again. And this Psalm is the Psalm of the Great Shepherd Who cares so intensely for His sheep. See; Isaiah 53:6; 1 Peter 2:25, Numbers 27:17; Psalm 119:176 and Matthew 9:36. In John 10 we can see how the Lord Yeshua (Jesus) -Jehovah-Rohi…becomes the perfect Shepherd of the sheep. JEHOVAH RAPHA (ROPHE) (yeh-ho-vaw' raw-faw') The Lord is my healer… The chief meaning of Jehovah is derived from the Hebrew word Havah meaning "to be" or "to exist." It also suggests "to become" or specifically "to become known" - this denotes a God who reveals Himself unceasingly. Rapha (râpâ') means: "to restore," "to heal" or "to make healthful" in Hebrew. When the two words are combined… "Jehovah Rapha" - it can be translated as "Jehovah Who Heals." Jeremiah 30:17; 3:22; Isaiah 30:26; 61:1 and Psalm 103:3. The Lord showed Moses a tree. The tree made the difference in the taste of the water. When we think of the many bitter experiences of life, what tree has made a difference? In the light of Calvary, the "tree makes a difference," the bitter problems of life can become sweet. Exodus 15:26 gives us the revelation of the name. God says in the last part of the verse, "...I the Lord Am Your Healer." Literally, I am Jehovah-Rapha, the Lord Who makes bitter things sweet. The name "Jehovah-Rapha" is a name that speaks to us and our need today. We live in a stressful world and society. Every day new problems confront us and we bend under the load of seemingly unsolvable problems. How can Jehovah-Rapha bring healing to a sick world? When will ultimate healing take place? We must always remember that God lives in eternity, and we in time and we are often in a hurry. God is never in a hurry. But the bitterness in our life will someday be made sweet. We have that promise! Other Names of God: "EL Emet" means the "God of Truth!" "Melech HaMelachem" means "King of kings" expresses superiority to the earthly ruler’s titles… He is the King of Kings! "Matir Asurim" – "Freer of the captives!" "Magan Avraham" – "Shield of Abraham." "Kadosh Israel" – "Holy One of Israel." "Avinu Malkeinu" – "Our Father our King!"